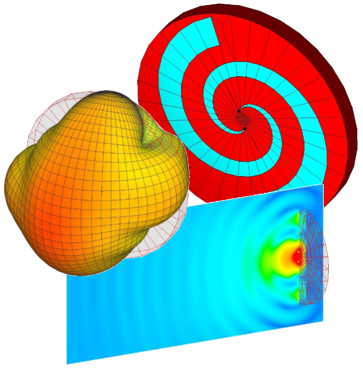 This white paper presents a design and simulation of a Cross Spiral Antenna. The antenna model is as in the paper “A multi-polarization multi-band cross spiral antenna for mobile communication devices”, ISAP 2012 International Symposium. The CSA antenna exhibits good performances at 3 frequency bands so it is supposed to be used as combined RFID, mobile-phone (UMTS) and GPS band device – 1.0 GHz, 1.8 GHz and 1.67 GHz, respectively. This printed device is manufactured at low cost FR4 substrate with Er = 4.4 and Hsub = 1.6 mm. Feeding area of the structure was done in two completely different ways. One was via a very simple wire bridge. The second feed area included coaxial feeders and connector with all the details. Despite that, results are very stable and similar. The configuration used for simulations is a standard desktop PC, while the simulation time is measured in seconds. The good agreement with measured results is also presented. Three designs of lens antennas with different lens types will be presented in this document. Such antennas with lenses can be used in real-life radar applications. The first scenario assumes that the first illuminated surface of the lens (closer to the horn antenna) is hyperbolic while the second is flat (farther from the horn antenna). Similarly the remaining two scenarios are plane-convex and concave-convex. All calculations are extremely efficient due to usage of Method of Moments (MoM) with unique higher order basis functions. The mesh elements can be 2 wavelengths large. WIPL-D built-in reflector object is customized to yield minimum simulation requirements for large apertures. The accuracy is controlled simply by adjusting number of segments. Simulations are prompt and results are tested for perfect convergence in only a few quick runs on a regular desktop or laptop. All the simulations last only a couple of seconds. 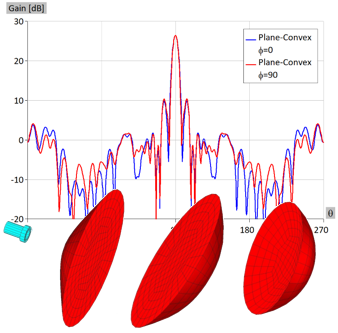 In this application note, four models of the discone antenna are simulated as demonstration. The aim is to get close to the real-life problems where discone antennas operate in real-life environment. Here, the dielectric support, radome covering the antenna, losses in materials and frequency depended characteristics of used dielectric materials are taken into account. All models will be created using WIPL‑D Pro CAD, a CAD modeler which includes Boolean operations. This approach is used since the antenna requires complicated dielectric mast, pedestal and radome, all intersecting each other. Discone antenna is a wide band structure, simulated very fast and accurately by using WIPL-D. WIPL-D is Method of Moments (MoM) code based on Surface Integral Equations (SIE). Owing to efficient execution on multi-core CPUs, using symmetry, built-in interpolation, the tool simulates UWB antenna at regular desktop PC (0.5 GHz to 10.5 GHz band in 55 frequency points). We illustrate the advantages of WIPL‑D Pro by using simulation of a simple printed fork-shaped dual-band antenna for Bluetooth and general UWB applications. 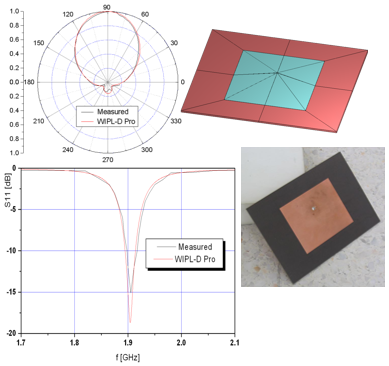 For the simulation of printed patch antennas and circuits, a simple usage of WIPL-D features, such as Symmetry planes and Manipulation Edging, yields very fast and accurate solution. WIPL-D efficient simulation on multicore CPUs allows simulation in seconds at inexpensive desktop and laptop PCs. 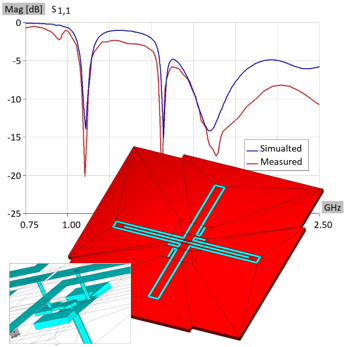 This eliminates the need for the high-end hardware platforms in order to simulate electrically small and moderate structures, even in wide frequency band. 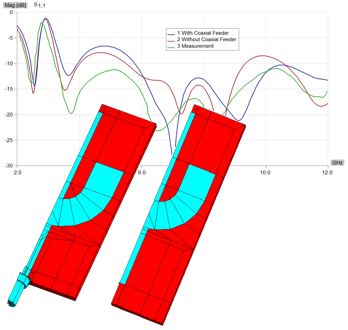 The application note also shows the importance of the feeding are in simulation of the printed models, where most often we have transition between several guide wave technologies (in this case, the transition from coaxial to microstrip). Vivaldi antenna is a commonly used antenna in broadband applications. As in this case, it is usually printed at the dielectric substrate. The simulation results show extremely wide band (return loss under -10 dB). 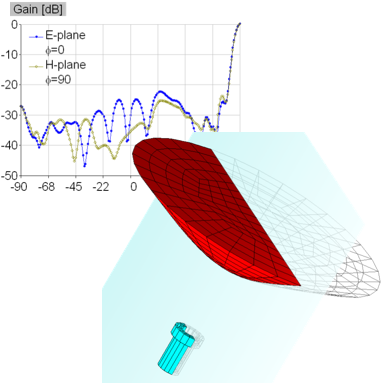 The simulation is performed in low number of frequency points due to the powerful built-in interpolation method (typically drawback of using MoM in simulation of UWB antennas since each frequency point is simulated separately). In MoM, the simulation is quite fast at the lowest operating frequency, but more demanding at the end of the frequency band. WIPL-D offers built-in features where each frequency point is simulated according to the current simulation frequency. In that sense, the overall simulation time in a wide frequency band is decreased several times. Here, the simulation is performed by using a regular desktop quad core CPU and lasts couple of seconds per frequency point. This paper presents the procedure for the design of hyperboloid lens antenna. It contains theoretical consideration and foundation, as well as procedure for design in the WIPL-D software suite. Hyperboloid Lens antenna consists of two parts: feeding cylindrical waveguide and the dielectric lens. Thus, the design procedure is approximately divided into two steps corresponding to the design of single part. Finally, the app note shows WIPL-D Pro model at 25.5 GHz, its radiation pattern and the simulation details. Simulation is carried out in seconds at inexpensive every day PC. Microstrip patch antennas are among the most popular antennas, used in various application areas. Modelling of such antennas is typically straight forward and can be done in WIPL-D general-purpose 3D modeler WIPL-D Pro. More advanced geometries or geometries provided by CAD file can be made simulation ready in AW Modeler or WIPL-D Pro CAD. A simple microstrip patch antenna is simulated. The software predicted the resonance at 1.905 GHz, while measurements pointed to 1.906 GHz. The simulated bandwidth is 19.35 MHz while the measured one is 19.3 MHz. The relative discrepancy is 0.05 % for resonant frequency and 0.25 % for bandwidth. Discovered by scientist Krauss in 1946, helix antenna is used in space applications, radar systems… Usually, it is manufactured as a wire, coiled around dielectric cylinder. It produces circular polarization of emitted EM wave. 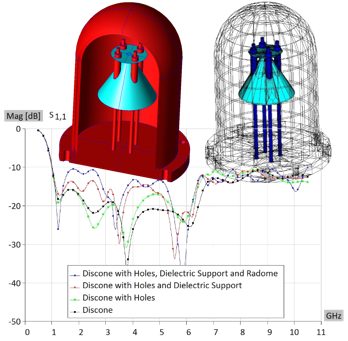 This application note encompasses comparing simulation times, number of unknowns and radiation patterns for three simulated helix antennas: wire helix, thin strip helix and thin strip with the dielectric mast. 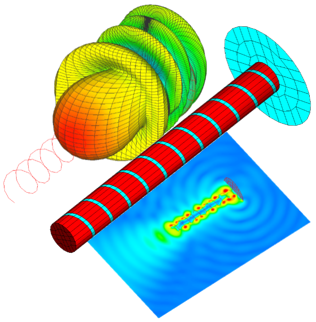 In WIPL-D software, various helix antennas can be successfully designed using powerful built-in object named Helix. The simulations were carried on regular desktop PC, with extremely low number of unknowns and simulation times measured in seconds. This allows fast tuning, sweep or optimization of the antenna otherwise known for the demanding synthesis process. 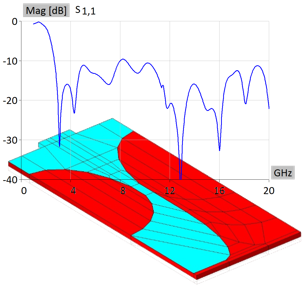 In this application note, we analyze two spiral antennas. The first one is with the air substrate, while the other one has the dielectric substrate between spiral arms and metallic reflector. In WIPL-D Pro, a spiral can be easily created and modified using built in Helix object. Especially if the same mesh over the close surfaces is required (here, antenna reflector and surface where spiral arms are located), built in manipulation named Copy\Layer can be very useful. The antennas are simulated from 0.3 GHz to 6 GHz in wide frequency band. For this type of simulation, number of frequencies can reduced by using the logarithmic scale and built-in interpolation. The simulation was carried out at regular desktop PC, requiring extremely low number of unknowns, with simulation time measured in seconds.